It is time, once again, to plan for NaruHina month. So let's get to it! Prompt ideas, prompt ideas, prompt ideas!!! Week 1 Question: Why are Naruto and Hinata perfect for each other? 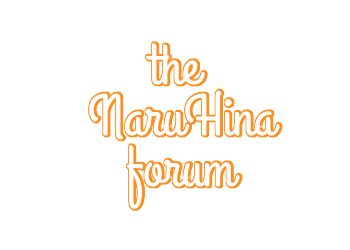 Week 2 Question: Post your own NaruHina headcanons. Week 3 Question: What is your favorite moment when Naruto stared in amazement at Hinata? Week 4 Question: If Naruto & Hinata had a song, what would it be? Final Days Question: What does NaruHina mean to you? At the end of each week, there will be a 'question.' This will either be an actual question or a statement which you will answer on the last day of each week. This gives everyone a chance to participate, if they so wish, even if they don't make edits, fanfiction, or fanarts. On the 7th, people will answer "Why are Naruto and Hinata perfect for each other?" On the 14th, people will answer "Post your own NaruHina headcanons." On the 21st, people will answer "What is your favorite moment when Naruto stares in amazement at Hinata?" On the 28th, people will answer "If Naruto & Hinata had a song, what would it be?" and on the 31st, people will answer "What does NaruHina mean to you?" Just so that you know what's been suggested. I feel it's best that we make a new thread for this separate NH month, so I closed the other thread and gave a link to this one. I also think it's a good idea if we include questions, like last year, to give people a break every once in a while, and so that those who may not be particularly eloquent or artistic may participate. I'm sure I'll think of more, and I'll keep adding them as I do. 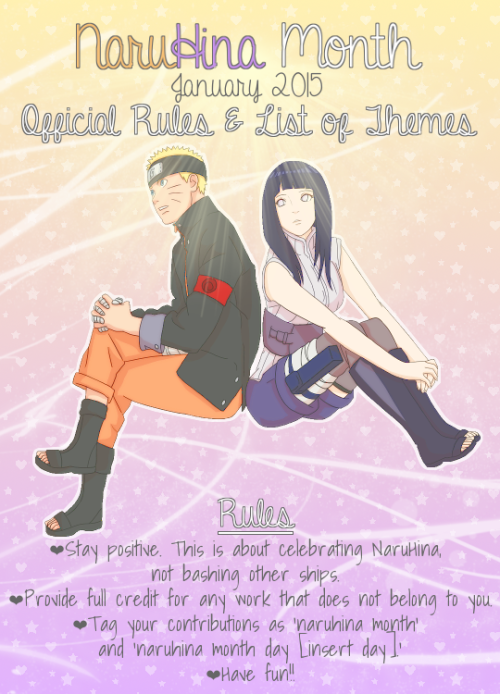 Orion wrote: Hey what's that NaruHina month thing? It's just a list of prompts to use to create whatever. If you like to make a song that's fine but if it's not following a given prompt then it's not part of NaruHina Month. It doesn't mean you can't do it, but there's fan stuff made due to NaruHina Month and people just making their own stuff (which obviously happens all the time). How about a "Jealous" prompt? And a "training together" prompt? Or "Announcements", like Naruto becoming Hokage or Hinata's pregnancy.. I've added your prompts to the list. Thanks for the ideas... they're really cute! Went ahead and added a couple more of my own. When does everyone think is a good time to start the voting process? If we decide on that, we'll know when we'll stop accepting prompt ideas. The official list of prompts should be released sometime between December 1 and 15 (though I feel like that is cutting it close). I'd kind of like to have voting start on December 1. What do ya'll think? Hello, everyone! I'm totally new to this site, but not to my love for NaruHina! 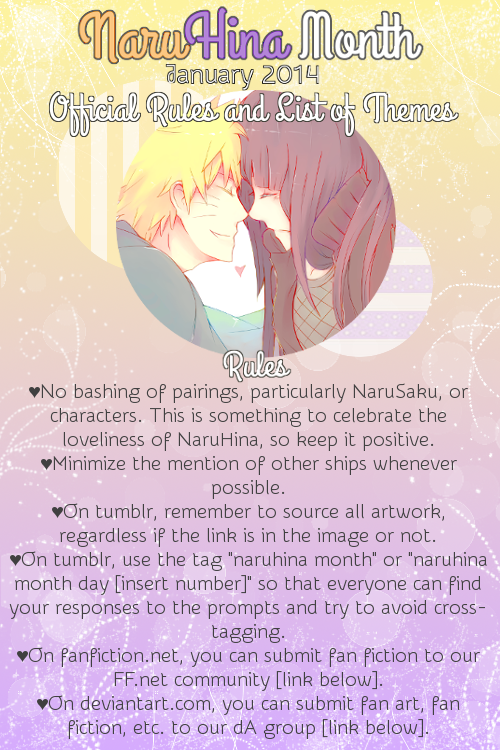 I saw the NaruHina Month 2015 info on Tumblr, and right on a whim, thought I'd just join in. I can see so many good ideas on the list. So, are we just putting up ideas for people to choose from? Or are we doing our own work for the NaruHina Month, separately? KajiWakahisa wrote: Hello, everyone! I'm totally new to this site, but not to my love for NaruHina! I saw the NaruHina Month 2015 info on Tumblr, and right on a whim, thought I'd just join in. I can see so many good ideas on the list. So, are we just putting up ideas for people to choose from? Or are we doing our own work for the NaruHina Month, separately? Right now we're just brainstorming ideas. Then, after a certain amount of time, all the ideas will be put into a poll. NaruHina fans across the internet will be able to vote for the ones they like the most. After the voting closes, we'll pick the top 31 and assign one prompt per day for January. Do you see? I'm not the best at explaining things. Hello!! I'm new to the NaruHina forum but I've been a big fan of NaruHina and Naruto for a really long time now. I saw the post on Tumblr and couldn't help but get overly excited. Last year I wanted to participate but I was confused and sadly I didn't do it. I was really disappointed. But now that I know and now that I'm here I just can't wait for January to write the prompts! When would we know what the prompts will officially be? Miss Love wrote: Hello!! I'm new to the NaruHina forum but I've been a big fan of NaruHina and Naruto for a really long time now. I saw the post on Tumblr and couldn't help but get overly excited. Last year I wanted to participate but I was confused and sadly I didn't do it. I was really disappointed. 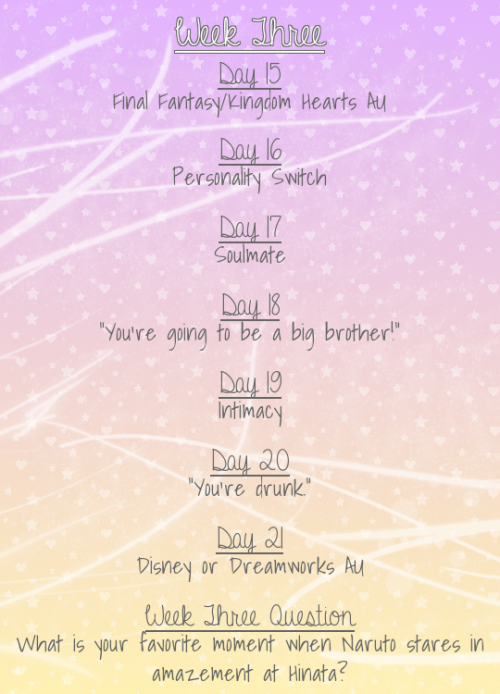 But now that I know and now that I'm here I just can't wait for January to write the prompts! When would we know what the prompts will officially be? Hi! And welcome to the forum! 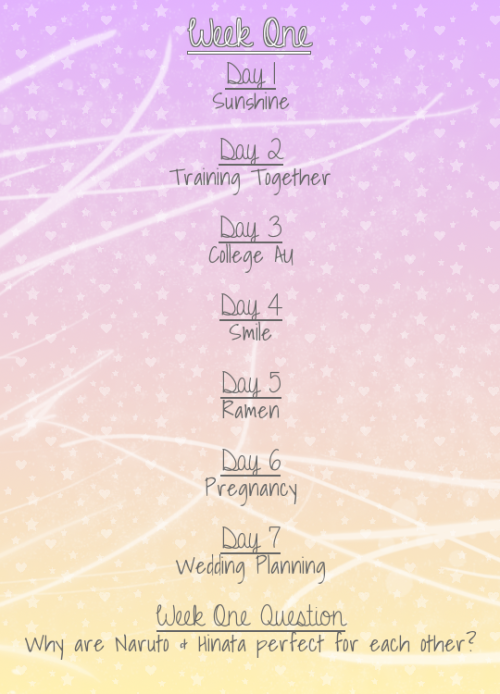 We haven't decided when the prompts will officially release, but I think we're going to shoot for around December 10! Thank you. I'll definitely message you! Oh wait I do have a question. Are there any rules for this? Miss Love wrote: Thank you. I'll definitely message you! Alright. Thank you so much. Thoughts as they stand almost shoulder to shoulder at Neji's funeral - how do they comfort each other? Thanks for your prompt ideas! I was thinking instead of limiting the song, we can make it more general. People have strong feelings toward songs/musical artists, after all. Lol. Also, may I suggest "Remembering/Mourning Neji," or something like that instead of "Thoughts as they stand almost shoulder to shoulder at Neji's funeral - how do they comfort each other?" I'll add your ideas to the list and wait for others' input on the two suggestions I had. I got a message from tumblr user, fatcatsarecats, whom I personally asked for prompt ideas because I heard she was interested in helping. -Why is Naruto perfect for Hinata? & vice versa. - What are your family vacation headcanons? - What are your favourite song/s for Naruhina? Hey everyone! Happy to see y'all working hard again this year! I love all the prompts so far. If I was more creative, I would help out with those. Aha. ^^" But mine would be really boring or vague. If there is anything you need me to do -- relay information, post information on Tumblr, announcements, edits, etc. -- please don't hesitate to ask! RawrrSakura wrote: Hey everyone! Happy to see y'all working hard again this year! I love all the prompts so far. If I was more creative, I would help out with those. Aha. ^^" But mine would be really boring or vague. If there is anything you need me to do -- relay information, post information on Tumblr, announcements, edits, etc. -- please don't hesitate to ask! Helping out with making advertisements and just promoting NH month would be much appreciated. "Share your ideas on the forum." "Voting for prompts begins December 1 and ends December 5." "Official list of prompts will be released December 10." You may want to get with her and talk about graphics stuffs. We will still need other random graphics, as well as a graphic with the official list/rules and a calendar. I made the list last year, and I don't mind doing that again if needed. Bubbles did the calendar, but I dunno if she's going to do any graphics this year. Strawberry-chan also helped out with advertisements. I'll see if I can get in touch with her on tumblr. I've already sent annalovesfiction a message, and I'll see if we can coordinate some ideas together for advertisement stuff. Do we have a color scheme of any sort or just the basic orange/yellow purple? When suggesting ideas, keep in mind that a prompt needs to be "small" in the amount of text or else it can't fit well when ads have to be made. It should also be as general as possible to allow for maximum flexiability when it comes to fandom creations. I'll post more later if no one else does by Friday night (it's Monday night for me as a reference). I'm sorry i am new to all of this and so can someone tell me what exactly are "prompts" and "questions"..Sorry to be a pain, im just really curious and very lost. Any question would have to be related to NaruHina somehow. A prompt can be anything as it's up to the person to tie it into NaruHina on their own. Can We Start With Hello?